It’s a standard demographic question that many of us answered on the Online Marketing Industry Survey. It’s a compelling indicator of how our industry is evolving in an area that truly helps us become better marketers: gender equality. Why does gender equality matter to marketing, and why do we need to understand this trend? There are hundred of reasons why gender diversity is good, and we can name at least a few. Diversity in the workplace fosters better working performance by forcing us to think more deeply about decisions and with new perspectives. Studies have also shown that creating a more gender-diverse organization will boost a company’s profits. As we discuss the following data, I encourage you to consider how you and your organization can foster more gender diversity in your workplace. When collecting the data, our goal was to reach the general online marketing population through a diverse range of channels. However, our results skew towards the Moz Community, as most participants discovered the survey through Moz’s blog and Twitter feed. 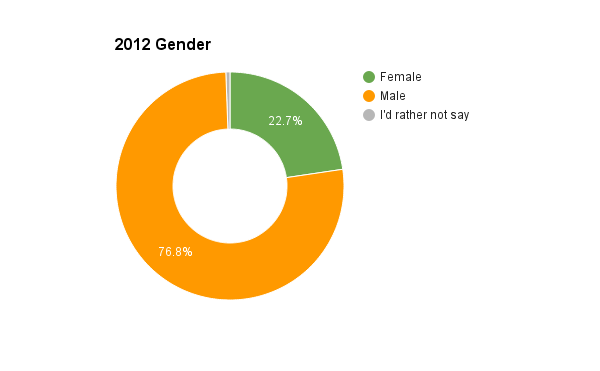 Of the 3,618 respondents, 1,089 respondents marked “female,” 2,516 marked “male,” and 13 marked “I’d rather not say.” Compared to December 2013, females have only gained about 2% representation in the Online Marketing Industry Survey, with a 7.3% increase in women since 2012. 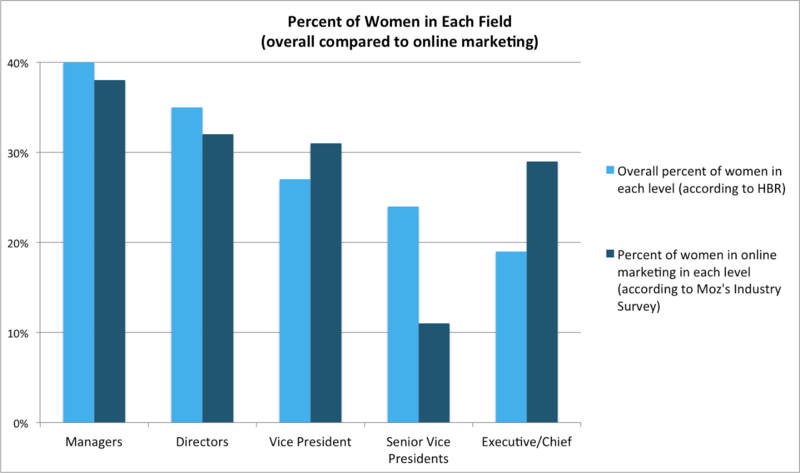 Every year, more women are joining the online marketing workforce. However, there’s still a long way to go before women represent anywhere close to 50% of that population. Many countries are missing from the diagram, as we only included countries that were represented by greater than 100 participants in the study. According to the survey, the smallest gender difference goes to Canada. (Go Canada!) The highest gender difference is India. Like many fields, online marketers have job title inequalities in the most poignant ways. Job titles are a good indicator of which levels and functions are geared towards men or women throughout different types of organizations. 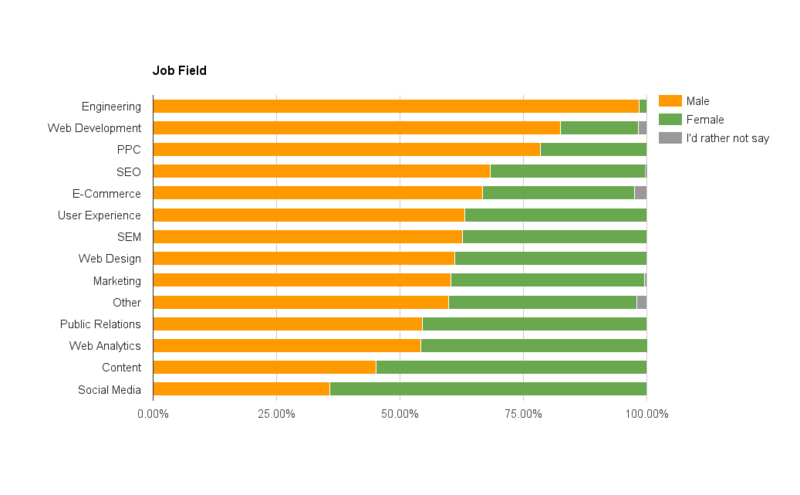 Based on these responses, the most equal fields are web analytics and public relations. Women were more likely to have words like “social media” and “content” in their job titles, while men dominate the fields of engineering, web development, paid advertising, SEO, and e-commerce (all fields that are considered more technical). The next chart looks at job level, where we see that males dominate higher-level jobs. The largest gaps between men and women are in the titles of president, business owner, chief, consultant, director, analyst, vice president, and strategist. 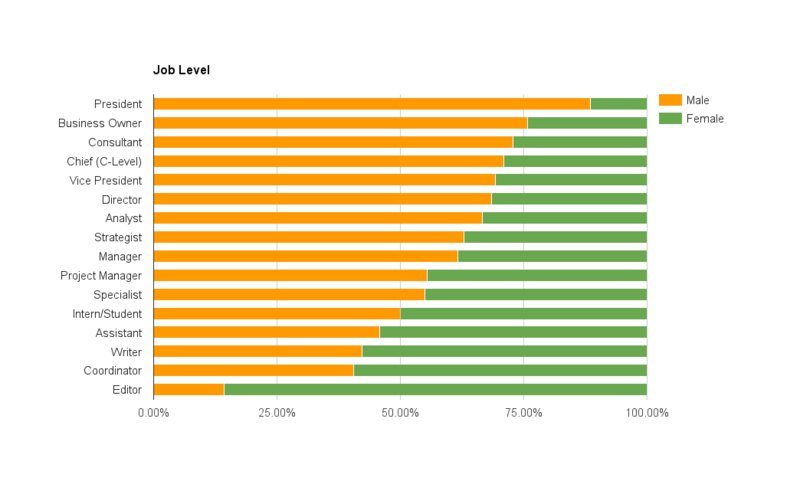 The lowest disparities in job level: intern, project manager, and specialist. Women are more likely to have “editor,” “assistant,” “writer,” and “coordinator” within their titles. How do these inequalities compare to other industries? According to HBR, on average, women make up 40% of managers, 35% of directors, 27% of vice presidents, 24% of senior vice presidents, and 19% of executive and chiefs. If we compare that data to our own, it would appear the online marketers are making strides in higher-level jobs—we’re above average for vice presidents and chiefs—but falling short for managers, directors, and presidents. Education? Nope. 80.80% of female respondents have 4-year and/or Master’s-level degrees, while only 64.50% of men reported having 4-year or Master’s-level degrees. Women who took this survey have a higher level of education than their male counterparts. Years of experience? Maybe. There are higher percentages of males with more than 3 years’ experience in online marketing. Yet that’s only correlation; it could be that women aren’t sticking to online marketing as long as men. The money question: How do salaries stack up? Based on the survey responses, there is a suggested pattern that men make more than women, and are paid differently depending on their job level. A few notes about our methodology: We’re reporting salary in U.S. dollars, because we asked survey participants to report their salaries in that form. In order to analyze the salaries, which were collected by ranges, we took the midpoint of the range. This isn’t the best model, but allows us to test the significance of the differences between genders and job titles. For you data junkies out there, we used the 2-sample Z-test. If the group had less than 30 respondents, then that group was excluded from testing. Thanks to our resident statistician, Mitch, for helping with the analysis. 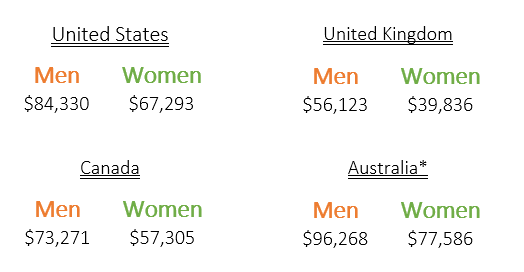 We show that men earn more than women in the United States, Canada, and the United Kingdom. Australian responses showed a slight difference between salaries, but it wasn’t significant enough to say with confidence that salaries were unequal. *No inequality proven: P-Values are too great to suggest inequality between men and women in Australia. However, the averages show, directionally, that men may make more than women. *No inequality proven: P-Values are too great to lend statistical significance to inequality between men and women. However, the averages show, directionally, where salaries swing. Comparing salaries for job titles, we can see that the differences in salary permeate through nearly all levels and functions. 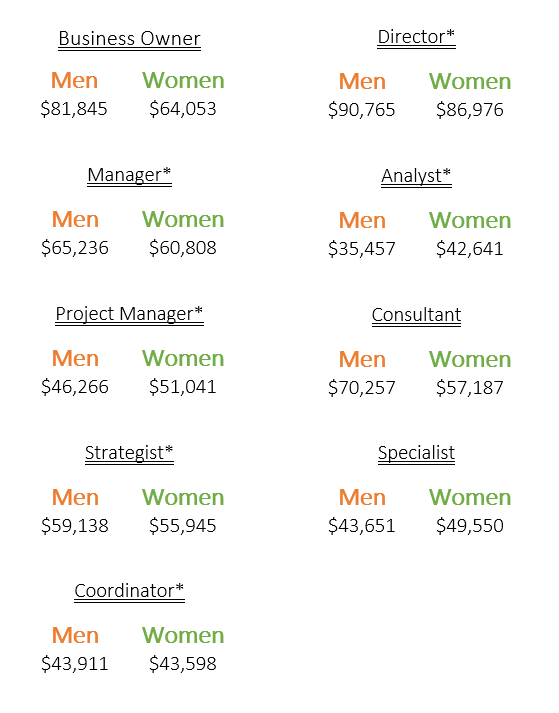 We show that men make more than women as business owners, consultants, and specialists. While we can’t prove disparity in all job functions, it’s worth noting that women may make more than men in some functions. Interestingly, when we filtered our results for only U.S. responses, the most unequal job levels are business owner, manager, and strategist. Tech companies are discussing salaries more openly, like SumAll and Buffer. This will shed light on any disparities occurring within these tech organizations and support equal pay. Companies partner with nonprofits, such as Ada Developers Academy, that aim at getting women into the technical space. Seer Interactive made a point to focus on helping women find mentorship from other women leaders. Ways to Proactively Welcome Women into Online Marketing, by Erica McGillivray. A recently published blog post, giving some great tips and tricks on how to engage women in online marketing. 6 Ways to Fix Inequality at Work, by the World Economic Forum. The WEF also has some great research and resources for improving education, accessibility, and more across the world.